BMW has been an innovator for many years, and the fully faired R 100 RT was one of the first proper touring bikes made. 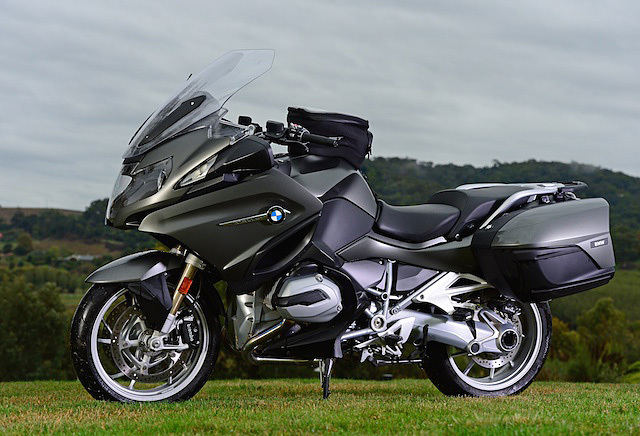 Ever since then BMW has had a tourer on the books, whether it be a flat twin or in later years a flat four, and then an upright four. One thing’s for sure, BMW has never let go of that flat twin layout and the new generation wazzer boxer RT is by far the best yet, mechanically, technologically and in real world performance. 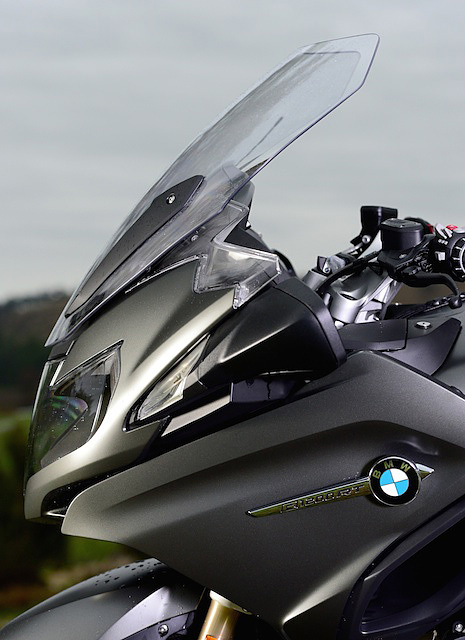 This is the third new generation BMW to be fitted with the air/oil/liquid-cooled boxer engine. Both the GS and GS Adventure have already been released to much acclaim with the liquid-cooled engine and the new 2014 RT has benefited from it too. It’s amazing how a basic change in the engine can create a different feeling from it. As each of the wasser boxer powered models have come out they have had heavier crankshafts. The GSA got an extra kilo of crank weight over the GS, and now the RT has another half a kilo added. This gives the RT better low down response which is perfect for the bike’s intended role of touring and a bit of sports when the road dictates such riding. The RT engine produces 92kW at 7,750 rpm with a max torque of 125Nm at 6,500 rpm. Some changes to gearbox ratios also contribute to a slightly more ‘flexible’ feeling from the RT. The latest RT is packed full of technology. Never before could you buy a boxer BMW with so much of it standard. There’s two riding modes – ‘Road’ and ‘Rain’, and there’s also ‘Dynamic’ which takes the performance of the bike up a notch. This is part of the Pro Mode which includes the Hill Start Control function. 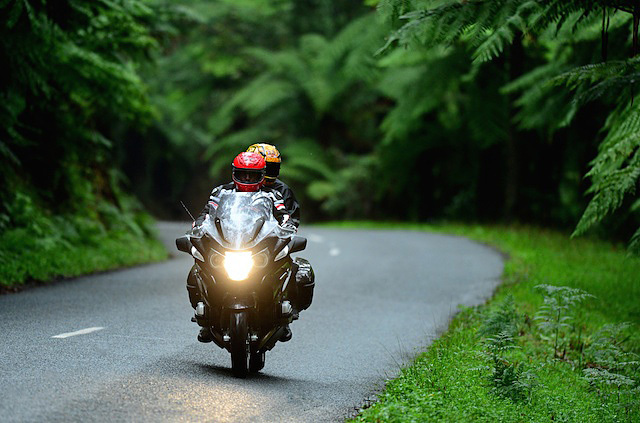 Simply put, as you go from ‘Rain’ through to ‘Dynamic’ the performance of the bike is greater. And Hill Start is perfect for two-up fully loaded starts on dodgy inclines. Did you think quick shifters were the domain of the race track? Wrong! BMW isn’t the only manufacturer to put quick shifters on its road bikes but it’s the first to put one on that operates both up and down. And on a tourer no less. That in itself is a good indication of the sporting prowess this bike actually possesses. BMW calls this the Gear Shift Assistant pro. Now, don’t forget this bike also has ABS, Automatic Stability Control (ASC), semi-active suspension in the form of Dynamic ESA (Electronic Suspension Adjustment) and for sound lovers a stereo which is one of the best I’ve sampled on a bike. You can pair your phone into the system too. Right, what else is new? Well, there’s the new bodywork of course, new chassis, new electric windshield, new instruments including the onboard computer (the dash even has two positions), new headlight and a new host of accessories. BMW has worked out that most RT buyers want their new bike kitted out with all the fruit. 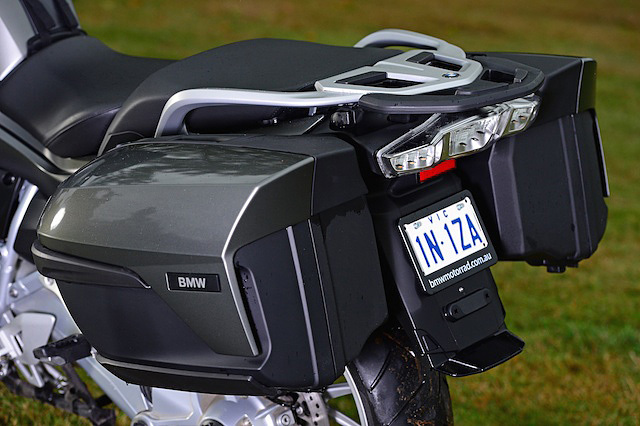 Basically you won’t be able to waltz in to your local dealer and order a bog stock 2014 R 1200 RT. 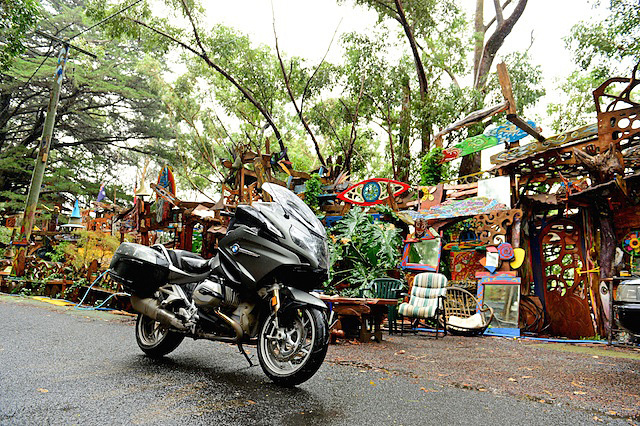 All Australian delivered bikes basically come with everything, and besides what’s mentioned above includes Cruise Control, RDC Tyre Pressure Monitoring, alarm, heated grips and seats, and a spot to plug in the BMW GPS system. A no cost option is the High or Low rider’s seats. 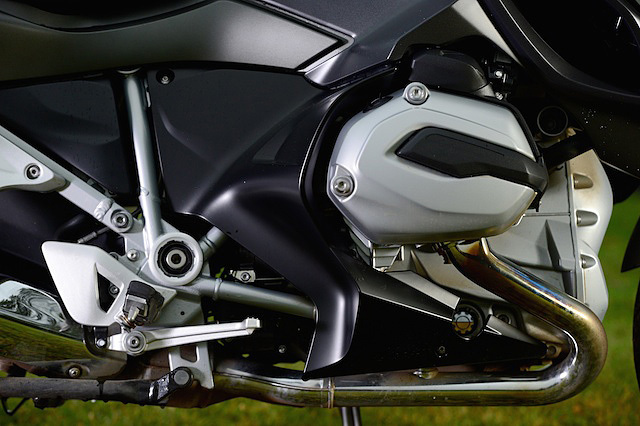 There are numerous accessories available, from the Akrapovic slip-on muffler to a colour matched top box and tank bag. 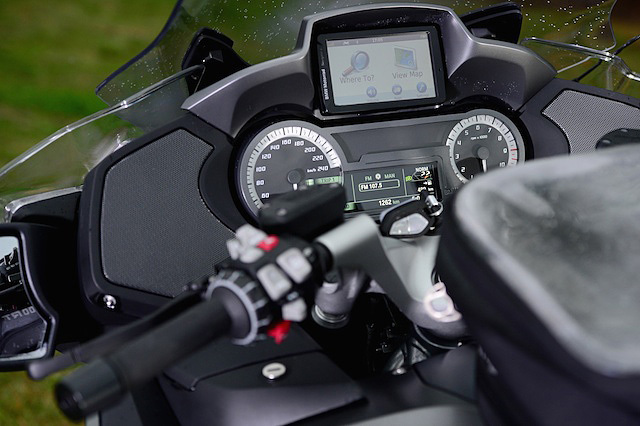 The test bikes were all fitted with the accessory navigation system and even accessory clear film on the pannier lids. The bike costs $29,990 in standard specification but when you see what those standard specs are I think you’ll see this bike is very well priced for what you get. There were two limitations to exploring the limits of the RT’s road-holding during the launch. One was the rain during the two days and also my wife on the back. Luckily for me I remembered the previous RT launch which had us riding that generation of RT – an amazing machine by the way – in a way probably never envisaged by BMW. I can’t emphatically say the latest RT handles better than the previous model due to the conditions but I believe it will, mainly because I had already experienced the Dynamic ESA. This semi-active suspension system works very well and to be honest I find it hard to fault. There were times I had the system set in soft and this tended to take some weight off the front and therefore reduce the steering feel. But, this was because I wanted to give my wife a softer ride for her crook back. When I had it in ‘Normal’ setting I could feel the improvement in steering but generally I was happy to have it in soft for the type of riding I was doing two-up. Seeing it was raining almost all the time I was able to test both the ABS and ASC. Once again, both are very hard to fault. You can basically slam the brakes on and just pull up, even in atrocious conditions, and likewise you can whack the throttle open while leaned over and the ASC will stop you from high-siding. Nothing’s infallible and I’m sure you could outfox the system if you so desired, somehow. But for me, both ABS and ASC work brilliantly. Other things I liked were the feather light hydraulic clutch, electric screen which is easy to use and very well shaped, and the Hill Start. This just requires you to pull the front brake on hard before the ‘off’ and then concentrate on getting the bike rolling without having to worry about co-ordinating the clutch, throttle and brakes. As you roll off the brake releases and away you go. You might think the quick shifter is a bit naff for this type of bike but I liked it. It does work better at some revs than others, and going from first to second gear wasn’t always smooth. I found the system worked best when riding slightly more aggressively than just cruising along. I didn’t use it all the time, rather I used a combination of clutch or quick shifter depending on how and where I was riding. Overall I think most people will like it when they adapt themselves to getting the best out of it. It’s a comfy jigger too. Both rider and pillion seats are heated, and you can adjust the rider’s seat in two positions. I would like the footpegs to be slightly wider for me but this is a personal thing. Really this bike is built to do lots of kilometres in comfort. My wife found the bike very comfortable and said she would like the top box to use as a back rest. Probably a better indication of the RT’s pillion comfort is the last time my wife and I did a full day’s ride on a sports tourer her back gave her plenty of grief for days after (she does have a back condition) but two full days on the RT gave no such problems. This is the best RT yet. The engine is an absolute beauty, you can ride it hard and it loves it or you can be real lazy with the gears and it still loves it. Handling is also a real strong point of the new RT, as is the comfort and the technology. 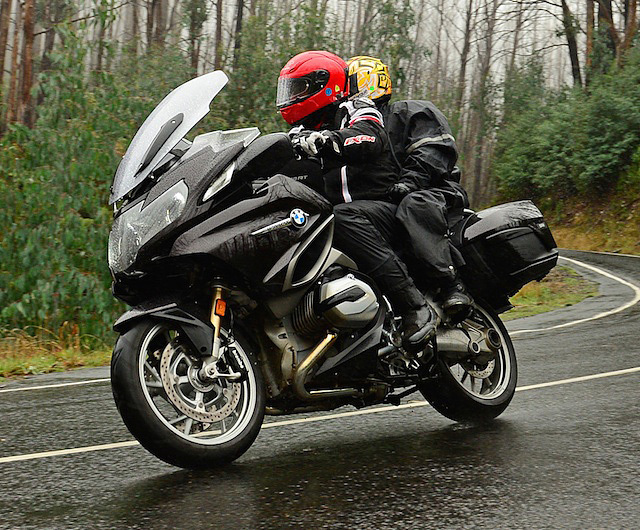 I could go on, but if you are in the market for a tourer or even a Sports Tourer you should test ride the new R 1200 RT.